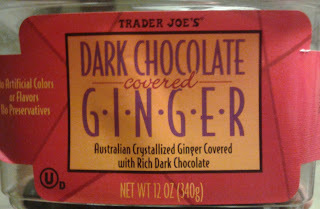 Here's a confession I have no problem making: Not only did I not have high hopes for Trader Joe's Dark Chocolate Covered Ginger, I really didn't want to try it either. It's not that ginger and chocolate can't work together - they can - but...big crystallized ginger bites. We have a history. It's not good. But, here we go. Why? Check out our forthcoming podcast episode. Thankfully, all my trepidation aside: I actually like these. They're not going to be my newest BSFF (best snack food friend), but I will be sad to see this now nearly-empty container go. 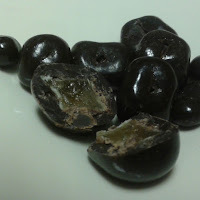 It's got to be the chocolate - there's a good, thick coat of the typical high-quality TJ's dark chocolate indigenous to all their other candies - with an added firmness and crunch from the candy lacquer. The middles are that formerly formidable crystal chunks that I usually like in only small doses. That softer core adds a nice textural change up, while that chocolate tampers down that fierce ginger bite into something more palatable. These Raisinet-sized bites do hit a certain balance. On one hand, when I need a chocolate fix, they deliver. 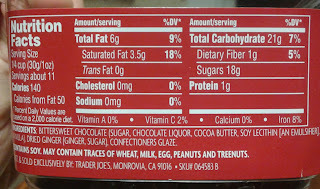 But I can eat way too much chocolate. Thankfully, the ginger, while pairing well enough with the chocolate, still makes odd-enough bedfellows that make eating more thana small handful seem like not the best of ideas. Both Sandy and I enjoy them, not sure who likes them more. I got a good laugh when she thought at first they were the new cocoa-covered coffee beans...oh, the face she made. Priceless. Anyways, it's $4.99 for the tub, and worth a try. I LOVE anything ginger. I didn't love these. I like the thin sliced crystallized ginger but only if it's spicy, sometimes it's just too mild and like ginger flavored sugar but that seems to vary bag to bag. The ginger chunks i'm not the biggest fan of the texture. Somehow this didn't work for me. And i love dark chocolate too. Was just an awkward pairing that just made me wish i was either eating some spicy ginger or some dark chocolate. Why doesn't TJs sell pickled ginger...? They recently changed the ingredients to contain butterfat...just so all those with dairy allergies are aware.